This is posted by way of my learning the ropes of my new iPad-pro photo-editing software, with files from one of my external 3 terabyte hard drives, that is usually attached to my main pc,I store all my pics on it to save space. It works seamlessly with Windows 10, CS6 and Nik-Efex....but all of these are getting old now. After some research I have discovered that a brand new PIXELMATOR PRO, app is on pre-order for my iPad Pro ....this will handle any RAW files, and photo editing just like CS6 ...but, until now it hasn’t been easy for iPads to exchange/store large photo files, plus no way of connecting external storage. Yesterday I took delivery of a RAVPOWER ALL-IN-1 FILEHUB...model RP-WD03...which connects to the iPad wirelessly to any storage device, from SD card, Memory Stick or external drive...this, together with PIXELMAKER... enables full photo editing on the iPad. But check first to see if you particular iPad will work with both app and hardware. 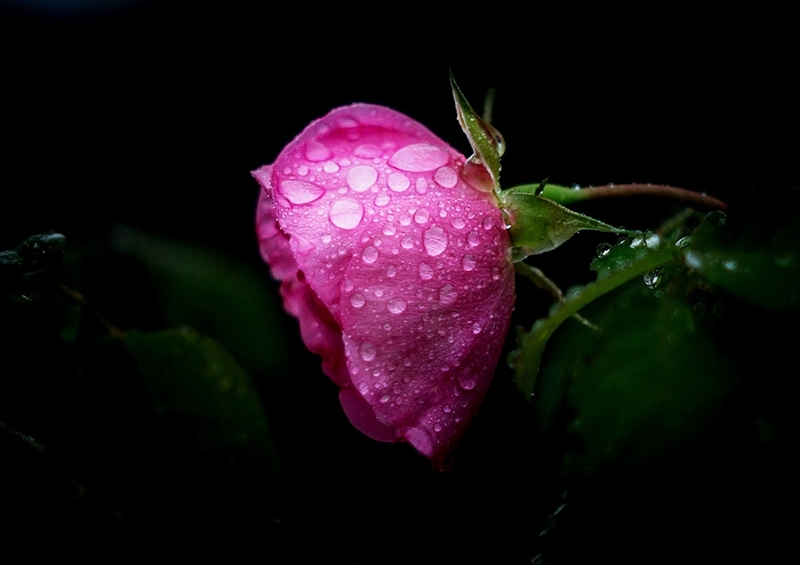 Looks good - the water droplets on the rose make the image. Not sure I could get used to iPad editing after spending almost nine years using my trusty MacBook Pro and Wacom graphics tablet. The iPad setup seems to work well for you, though. I wish I could embrace the tech like yourself and teach myself new techniques I'm just way too lazy. Can I suggest a small edit, crop to the stem and maybe clone out the green to the left of the flower which is beautiful by the way. Simon's edit suggestions make sense - though I think the green bits would be easier to burn in to black rather than clone. i like the processing of your image, it really has a pop to it. You think that's stoopid? How's this for stoopid? Mrs K popped into town this afternoon, leaving me to chop veggies for a casserole. I discover we don't have a tin of chopped tomatoes, so I phone Mrs K.
Me: We don't have a tin of chopped tomatoes. Mrs K: There's two large tomatoes in the fridge, use those. Me: What do I do with 'em? Me: will they be the same as chopped tomatoes? Mrs K: I'm not sure I should leave you alone with sharp objects. Mmmmm I too am band from using sharp objects. Funny story (It was not funny at the time) so the story involves me, a huge box (I mean huge) a swiss army knife, my lower leg (calf to be precise) an ambulance and 9 hours in A&E. You can work the story out from that yourself I still can't talk about it or watch Casualty. Love that Fooj ... fabulous colour.. but I hate all flat black backgrounds for flowers So. ....I like the hint of other stuff in the darkness / background . Thank you Polly.....that is how I saw it too.....kept the bloom in context, whilst making the whole...POP!